Sign up below to be notified when our event day volunteer schedule goes live. 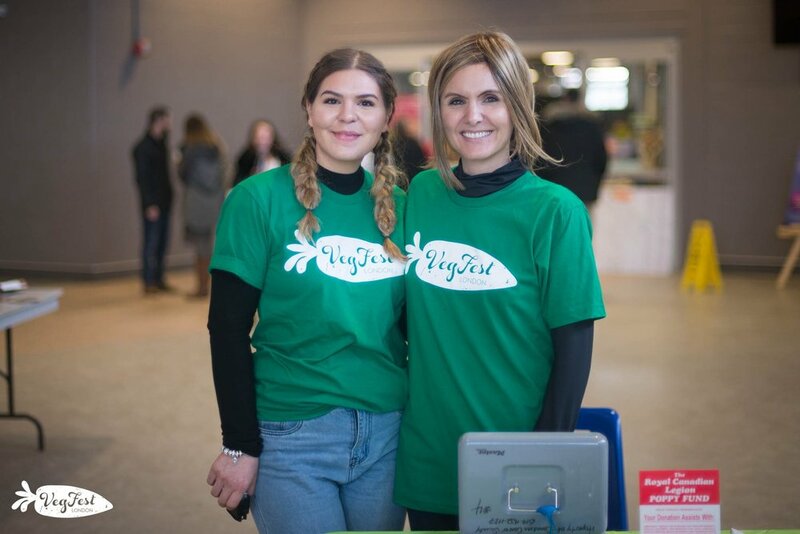 Event day volunteers assist on the day of VegFest London (November 9, 2019), helping sell festival merchandise, support speakers, assist in the children's area, take photos, dress in veggie costumes and so much more. Event day volunteers work together with our committee behind and in front of the scenes to make it all happen. Periodically we also reach out to our list of event day volunteers to assist with pre-festival promotion. What area of the festival are you interested in volunteering for? Children's Area Greeter & Admissions Merchandise Sales Volunteer Check In Speaker/Tech Support Veggie Mascot Floater Information Booth Set up or Take Down All of the above! VegFest London 2019 Volunteer Waiver Please review before submitting your application to commence volunteer duties at VegFest London. Thank you for being a crucial part of this festival. As VegFest London is a vegan festival we ask that volunteers do not make recommendations of consuming any type of animal products or byproducts to festival attendees, while volunteering at the festival and representing the festival. Throughout the duration of VegFest London we ask volunteers to communicate in a professional and kind manner and refrain from using profanity. VegFest London - Volunteer Waiver	This Release and Waiver of Liability, (the “Release”) executed on this 9th day of November 2019, by the person agreeing to the waiver (the volunteer), in favour of VegFest London and its organizers. RELEASE AND WAIVER: Volunteer, for him/herself and his or her legal representatives, spouse, heirs and assigns, does hereby release and hold harmless VegFest London and insurers, organizer, representatives and assigns from any and all liability claims, which arise or may hereafter arise from Volunteer’s Activities with VegFest London. VOLUNTARY SERVICE: Volunteer understands and acknowledges that he/she may decline any volunteer role or position at any time if he/she feels such role or position presents a risk to health or safety or for any other reason. Volunteer agrees to advise VegFest London of any preexisting conditions that would preclude involvement in any activity. INSURANCE: The Volunteer understands that, VegFest London does not carry or maintain health, medical, disability insurance coverage for any volunteer. PHOTOGRAPHIC RELEASE: Volunteer does hereby grant and convey VegFest London the right, title and interest to any and all photographs or video of me made during my volunteer role at VegFest London. Thank you for your application & interest in joining our volunteer team. Closer to the date of VegFest you will be sent a schedule to sign up for a shift. In the meantime, if you have questions, please email info@vegfestlondon.com. Click here to review and download the volunteer waiver. If you're under 18 years of age, please have your parent/guardian sign and complete the waiver before beginning your shift at VegFest London on November 9.